Severn Records announces an October 6 release date for The Last Shade of Blue Before Black, the new album from the legendary Original Blues Brothers Band, featuring guitarist Steve Cropper and sax player “Blue Lou” Marini, with special guests Eddie Floyd, Joe Louis Walker, Paul Shaffer, Dr. John, Matt “Guitar” Murphy and Joe Morton. “Had anyone told me in 1978 that in 2017 I would still be traveling around the world and playing with the Blues Brothers’ Band, I would have said they were out of their minds,” says “Blue Lou” Marini. “But, amazingly here we are with a new CD and still playing all over the world. This album is a true labor of love and I’m so proud of the organic way it came about. We really wanted to honor our history and to include some of our favorite musicians that we’ve worked with and loved over the years. We have the legends, Eddie Floyd and Dr. John, plus our original band leader, Paul Shaffer and the great bluesman Joe Louis Walker. 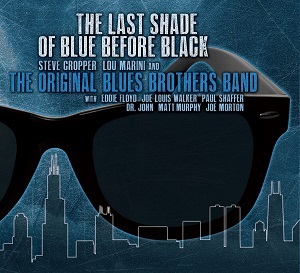 The Last Shade of Blue Before Black was produced by Lou Marini, Steve Cropper and The Original Blues Brothers Band and recorded at IWII Studios in Hoboken, NJ, by Jay Messina. “We wanted to present some new original material and do some tunes that hearkened to our past,” declares Marini. “This is a live CD, with everyone recording at once, mostly first or second takes and live vocals and solos. The only overdubs were some baritone sax parts and a few minor fixes. We were blessed with a fantastic studio that suited us so well, IIWII in Hoboken, New Jersey, and the world’s greatest engineer and friend to all, Jay Messina. Essentially begun as a one-time musical skit that debuted on NBC-TV’s Saturday Night Live” in 1978 and fronted by John Belushi and Dan Aykroyd as Jake and Elwood Blues, the band became an overnight sensation, spawning numerous TV appearances, hit albums, two blockbuster movies and global touring. “I think the power and joy of this great band that has been playing together for so many years is evident,” states Marini. “We love each other and love making music together. Everyone played their asses off on this CD and none more so than our wonderful bassist, Eric Udel. Eric died tragically in September from a fall here in NYC. He was a great musician and a sunny, funny man whom we all loved. We dedicate this album to him as well as our other fallen and still greatly missed brothers, Donald ‘Duck’ Dunn” and Alan ‘Mr. Fabulous’ Rubin.